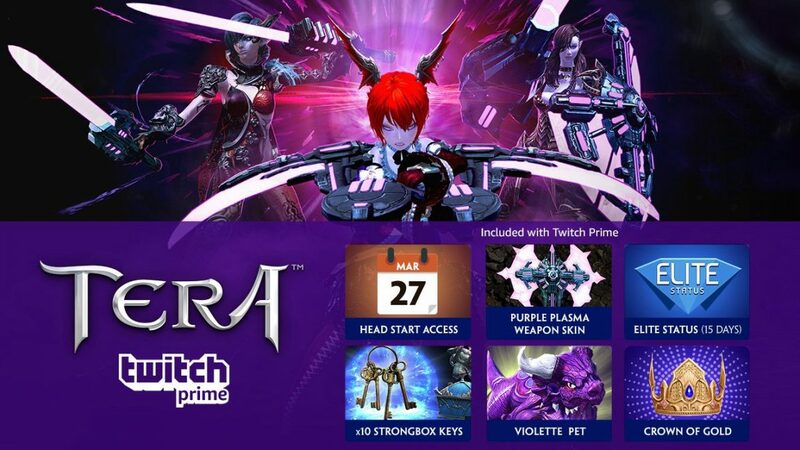 If you’re a Twitch Prime member you can get early access to TERA on PS4 and Xbox One now, before general release next week. There’s also a bunch of free loot waiting for you, including a Purple Plasma weapon skin, dragonette pet, a crown of gold and 10 strongbox keys. You’ll also get Elite Status for 15 days, which gives you gold and XP boosts, fast travel options and discounts in the TERA store. TERA is a free-to-play MMORPG from Bluehole, the creators of PUBG and the upcoming Ascent: Infinite Realm. Step 1: Sign in to Twitch and hit the Prime Loot icon to grab a code. Step 2: Visit and create a new En Masse account or log in to an existing account. Step 3: Once logged in to your En Masse account, enter the code you received from Twitch. Step 4: Select your console and you will receive an additional code. Step 5: Enter this code on the console you chose in Step 3. Step 6: Download the TERA client, create a character, and join a server. Once in-game, you can find your loot in Item Claim (accessed from the main menu under the TERA Store sub-menu).